As the title indicates, this is not “Jack and the Beanstalk,” at least not quite as you know it. A narrator attempts to tell the traditional tale, but Jack is very much in the leading role. In his dismay over his dismal situation, Jack can’t keep his comments to himself. He directly appeals to the storyteller, questioning and challenging every lousy turn of events. “But Bessie’s my best friend!” Jack protests when forced to sell his cow. In disbelief over the trade he’s supposed to make, he exclaims: “Five beans? That stinks!” And when the text relates that he throws them out the window, he objects: “But I’m SO hungry! Can’t I eat one?” Youngsters will readily respond to this playful if sophisticated perspective wherein Jack repeatedly breaks the wall to address the storyteller. 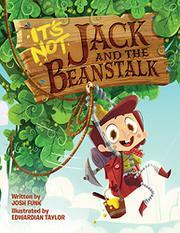 The giggles increase as Jack’s remarks provoke responses from the narrator. Gradually, Jack starts talking to the other characters in the book until he effectively shuts out the narrator and grabs control of the action. The characters’ commentary appears in color-coded speech bubbles: Jack's in green, the giant's in ochre, Cindy's (Cinderella) in pink. In fact, children will find a host of fairy-land denizens. Cartoon-style art in garish colors and characters drawn with comically off-kilter features emphasize the absurdity of the story. The primary cast is all white.